Welcome to the final day of my mini series exploring popular personal-finance apps. As I prepare to track my spending in 2017, I have to decide which tool to use. Earlier this week, I reviewed my experience with You Need a Budget. Yesterday I compared Mint and Personal Capital. Today I'll talk about Quicken. And at the end of this article, I'll reveal how I've decided to track my money during 2017. For years, my personal-finance tool of choice has been Quicken. I used it to track my descent into debt during the 1990s, although those files are exiled to inaccessible 3-1/2 inch floppy disks. That said, I have transactions in my Quicken datafile going back to 19 February 2004 — almost thirteen years ago! I have a list of accounts and spending categories. I've been using the same accounts and same categories for thirteen years. If an account becomes inactive, I'm able to hide it from view (without deleting data). Account registers work just like check registers. Yes, I'm one of those old men who still uses checks now and then. And because I was raised using checks, I prefer a check-register interface. I enter transactions by hand. Automatic downloads are available but I don't use them. Manual data entry helps me remain more aware of my habits. That said, I do use automatic updates for my investments. And I like that Quicken downloads stock prices every day. I don't use the budgeting feature, although I might give it a go in 2017. From time to time, I do use other built-in features though, like the retirement calculator and the home inventory. Finally, I'm a big fan of the reports. Quicken 2007 is capable of producing dozens of different reports, all of which are customizable. As a money nerd, I like this. Until yesterday, I hadn't upgraded my copy of Quicken in over a decade. I stuck with Quicken 2007 — warts and all. I was fine with it. The software works. Better still, I know how to use it. I know how to make it do the things I want it to do. This is no small thing; in fact, as you'll see, it's probably the biggest determining factor in which tool I use to track my money. Yesterday, however, I gave myself permission to upgrade to Quicken 2017. I didn't feel like it was fair to review the current versions of Mint, Personal Capital, and YNAB against something a decade out of date! Let's see how the new version compares to the old. I'm pleased to report that it was quick and easy to copy my data from Quicken 2007 to Quicken 2017. (I'd been worried.) And the new software was easy enough to figure out. Compared to the older edition, the current version of Quicken looks much prettier. (Quicken 2007 is downright ugly.) The interface is spartan and sleek. This simplicity comes at a price though. Quicken 2017 has far fewer features than Quicken 2007. It offers similar functionality to Mint (also owned by Intuit) and Personal Capital but lacks the advanced reporting tools, planning calculators, investment tracking, and home finance utilities — emergency records organizer, home inventory, etc. — found in Quicken 2007. The new version is prettier; the old version is more powerful. Quicken 2017 does offer a few advantages over its elder sibling. It's hard-wired to connect to the Quicken mobile app, for instance, which is probably useful to a lot of folks (but not me). You're able to add attachments to a transaction, which is very cool. You could, for instance, scan in receipts for tax-related purchases and tag them to the appropriate transaction. I like this. That said, there have been some changes that make things more difficult rather than less. For instance, Quicken 2017 is not designed for manual data entry. In the older version I'm accustomed to, it's possible to enter transaction after transaction after transaction without ever taking your hands from the keyboard. That doesn't work with the new version. Now you have to click the “new” button every time you want to enter a transaction — and if you want to enter a description in the Memo field, you have to click yet another button. Yikes! So fussy. Plus, recent transactions are listed at the top of the screen instead of the bottom of the screen. Some of the reports in Quicken 2017 are…strange. Who the hell needs to see a “spending cloud” report? What a pointless feature. I didn't like the registration process either. Even though it's desktop software, you still have to create an Intuit account to use it. I have had nightmare experiences with Intuit accounts — for months, I was charged for a QuickBooks Online account I had cancelled — and I didn't want to create one. But if I wanted to use the program I'd just purchased, I didn't have any option. The thing is, after using Quicken 2017 for a couple of days, I'm not sure I do want to keep it. If I were starting from scratch (and didn't have a copy of Quicken 2007 already), I'd almost assuredly opt for You Need a Budget instead. Quicken 2017 certainly isn't terrible, but I see no reason to “upgrade” from my existing copy of Quicken 2007. Just call me Grandpa J.D., I guess. So, after weeks of experimentation with four (well, five) different apps, how will I track my money in 2017? To be honest, I'm probably going to continue using all four money tools I tested. Here's why. Mint and Personal Capital are relatively passive. Now that they're set up, I don't have to do anything unless I want to. (Well, I guess I have to manually update my credit union balance in Personal Capital since it refuses to connect.) Instead, I can open each app on my iPad now and then to see how things are going. I've been doing that with Personal Capital for several years already, so that's nothing new. And if I don't like the info I get from Mint, I'll just stop using it. But again: there's no overhead involved in continuing to use both of these. There is overhead if I choose to track transactions in Quicken and/or You Need a Budget. But that's overhead I want and expect. As I've said repeatedly, the process of entering transactions by hand forces me to confront my spending habits. Plus there's something meditative and satisfying about balancing the books every week. Right now, I intend to use both You Need a Budget and Quicken 2007. Each offers features the other doesn't. I'm open to the idea of moving completely to YNAB, but I'm just not there yet. As you can tell, I love having a decade of data in a desktop app, so I'm not yet ready to give up Quicken. I suspect a likely scenario is this: I'll use Quicken 2007, just as I always have; meanwhile, I'll pay for a year of YNAB and use it to get my spending habits in check. So, there you have it. Six weeks of money nerd experimentation has led to an indefinite conclusion. To me, there was no clear winner. If you don't like the tool you're using — or if you don't yet have a tool — make a choice based on your needs. If you need to track your transactions, YNAB is still a good choice, but I'd also encourage you to try Quicken. If you don't intend to track your spending, then consider an app like Mint or Personal Capital to monitor your progress. Choose Personal Capital if you like tracking your investments; choose Mint if you're more interested in day-to-day spending. I know there are other apps out there, and I'm sad I didn't have enough time to try more of them during this process. That said, the hard work is now done. My accounts are set up in four different apps, and I'm actively tracking my spending. As readers suggest other apps to try, it'll be easy enough to add them to the mix. And when I do, I'll be sure to share my impressions with you! There are 27 reader responses to "Comparing Quicken 2017 to Other Personal-Finance Apps". I haven’t tried 2017, but when moving to 2016 found that there were several things I had to set to get the level of control we used to have with the older versions. See if you have this option: Edit, Preferences, Navigation, and then an option for Use Classic Menus, etc. This opened up a lot of options for me. Also, I was able to set some options in the Preferences under Data Entry to do mouse-less data entry. I do use a spreadsheet for budgeting since I find Quicken’s budgeting section less flexible than I prefer. It’s so awesome to have 22 years of data to slice and dice — so perfect for a personal finance geek like me. Thanks for the review of these different products and services as well as your recommended use cases for each product. I’ve been putting off switching to something more current as I am still using…Microsoft Money. Is there a way to subscribe to post notifications? I came over here to read your review of YNAB nad discovered you’ve posted tons of stuff here lately. I though the newsletter was supposed to include all the latest posts. I must not be reading them carefully enough. Thanks! 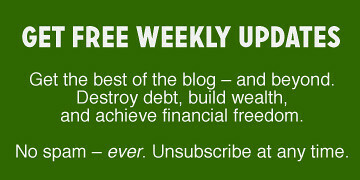 There are links right at the top of this post to subscribe via email or get the RSS feed for a reader. I’m like you but I use MoneyDance and YNAB. Moneydance (http://moneydance.com) is like Quicken but has all the power of Quicken 2007 (for example, it can track specific lots of stock sold – new Quicken for Mac still can’t do that). Moneydance is java based and a license will run on Windows or Mac (it also has free mobile apps and you can keep two computers in sync with your data file via dropbox. I switched over from Quicken for Windows years ago when I saw how bad Quicken for Mac was. Moneydance has my complete picture for investments, taxes, etc. However, YNAB is hands down the best for really managing where you spend money in a thoughtful way. Despite that we’re all in this to save money and have better financial lives, we all think about money and spending a little differently from the next person. Therefore it makes perfect sense to me that one app would never encompass all the needs any one person has for tracking spending. They’re tools like anything else, and we use the ones that work for us. Don’t feel bad about Quicken 2007 vs 2017–technology is changing things so rapidly! It’s hard when you get comfortable with the way something runs and then they change it. I’m younger than you, and I’m having some of these issues, too. If it works for you, leave it alone because realistically, there’s no way to keep up every time there’s a new version! Thanks for trying out the different money apps and sharing your experience. As I said in my other comment, we use Mint to track daily spending, but I still use a good, old spreadsheet to track monthly totals for income, spending, and saving. Although I’m getting curious about Money Dance after seeing multiple comments (and that it is Linux-friendly!). I have been using Quicken for Windows, mostly the Premier version, religiously for almost 25 years. I think the reduction in features is limited to the Mac version. All of the items that you mention as not being able to do (e.g. manual entry without clicking a new button, the memo field, sorting, advanced reporting, etc,) or not existing (e.g. home inventory and emergency records) are possible or do exist in Quicken Premier for Windows. I don’t currently use the home inventory or emergency records organizer but I am going to look into them. Since I review the budget and net worth with my wife every quarter, I use Excel for the presentation of the information because it easier to organize and format the way she likes to see it. However, all of the information comes from Quicken. I also use Personal Capital because it is faster or easier for some things like a quick checkup on our net worth or how our investments performed that day. I use the retirement planning tools from Quicken, Personal Capital, Fidelity, and an Excel spreadsheet. They all have their strengths and weaknesses. FYI: Quicken is no longer owned by Intuit, and no longer has any relation to Mint. Intuit sold them last year! In fact, since that happened, Quicken for Mac has gained *a lot* of features in an attempt to bring it to parity with the Windows version. I’m looking forward to the future… I’ve been using Quicken on the Mac for 5-ish years, and buy the new version religiously. Also, you can sort the columns in Quicken 2017, so that new transactions appear at the bottom… I’m a big Quicken 2017 advocate. Happy to talk to you about it more! Great review JD. I converted from Microsoft Money years ago when they went out of business and switched over to Quicken. Just upgraded to the 2017 version and am perfectly happy with it. I haven’t tried Mint or YNAB, but I’m a big fan of Personal Capital for tracking portfolio performance and fees. Between those two and good ol’ Excel, I’m in good shape! New Quicken – Click the date header in the check register. That flips the order so the most recent entry is at the bottom. I think you can then enter transactions sequentially at that point without mousing. Spending cloud – if TED Talks posts this way, it must be good. For those who fear numbers, this is a quick snapshot of spending. Works better if you only have a handful of categories. Have you considered trying YNAB classic. The biggest benefit being you do not have an annual fee. Can still be bought here: https://purchase.youneedabudget.com/ I also find it easier to use (personal view). It is run locally and as such much quicker and fully focussed on manual input. I’ve been using Quicken for probably as long as you have, JD, and am kind of hooked on it. I’m currently on 2016 and don’t plan to upgrade it for a few years. I do let it sync to my accounts and download transactions, but that’s more a reconciliation feature than having it do it for me. I enter the transactions manually, and then once or twice a month I’ll download from by bank and credit card companies to match up what I’ve entered and reconcile. That’s a big thing for me, keeping my records in sync with the bank – I don’t want to think I have money there and not have it. 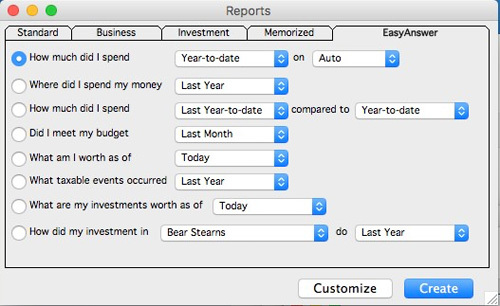 I also like the reporting features of Quicken which are much better and robust than other apps I use. I also use YNAB and Personal Capital a lot. Personal Capital mostly for tracking investment accounts and the retirement calculator. It’s the one tool, that for me, will download all my accounts – Quicken won’t sync with Betterment, so it’s much harder tracking net worth with that program. I find YNAB is great to use with my wife. Once a month we have our budget meeting, then through the phone app both of us can enter transactions as we make them. This has really helped her get involved with the family finances. With Quicken I was doing it all and the phone app was clunky enough that she didn’t use it regularly. With YNAB it’s really easy to record transactions as we make them, and she’s in there recording the transactions and able to be more actively involved as co-CFOs for our family. I’ll continue using the three applications for a while. Like you mentioned, each has it’s strengths and weaknesses, and together I feel like I can get a wholistic view of my finances as I use the three different applications. BTW, I used Mint for a while too – thought it would be more of an online version of Quicken, but doesn’t have the reporting features I was looking for. 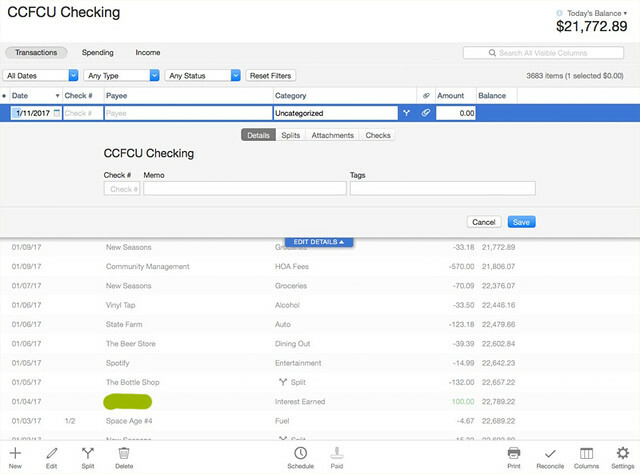 Also I feel that Quicken lost something as it’s been going more toward the Mint interface. That’s just my personal opinion. I tried out Quicken a little over a year ago and just knew that I would love it. I’m an accountant and totally into tracking my personal finances, but I disliked it so much that I returned it for a full refund. I didn’t understand why people were so committed to it, but it makes sense know that you mention how much better the older versions are. Hopefully they’ll make some good improvements with new ownership. However, it led me to give YNAB a second try (had tried them previously). I’ve made adjustments to YNAB that make it the absolutely perfect software for me. Specifically, the main thing that made me dislike it was that I couldn’t forecast and budget my income. The premise in YNAB is that you only budget for money you currently have received. I realized that I could budget all that income simply by adding categories and including it as a negative expense and haven’t looked back. It is hands down THE best budgeting software out there. I love that it has a different perspective that helps you succeed with your money, specifically that you are assigning a task/category to each and every dollar that you already have, and then each dollar that comes in. I LOVE that I can login to YNAB and see how much I have to spend immediately and see my goals grow. I am up to Quicken 2016 (after starting with Quicken 2000 for Windows), but switched all my computers to Mac in 2015. I needed a solution to run Quicken for Windows on Mac, and I eventually found CrossOver from CodeWeavers. It’s the best $50 I spent to retain the features of Quicken for Windows that I use. I’ve had one short-term issue in the two years I’ve used the combination (an issue quickly fixed by CodeWeavers tech support via an update), other than that it’s worked flawlessly. Microsoft Money Sunset Edition for the win! I personally have transactions dating back to 2002 and have thought about “upgrading” but MS Money keeps on rocking, so no need to change. And its free! Funny I hate Intuit – leaches (I am an unfortunate user of Qucikbooks in a couple different formats) So glad to see quicken is not a part of them maybe worth trying out. Long ago I have used quicken but the lack of an Mac version led me to use Moneydance. It is simple, affordable and not specifically designed for a given country. get regular update and present all the characteristic of multi accounting, share registrer, and a good set of report that are reasonably customisable. Well that is my favorite and it is not expensive. I’ve used Quicken on a Mac since 1995 upgrading along the way. I stopped at version 2006. Its now on its last legs as the OS X that supports it is getting farther away. I bought Quicken Mac 2017. Transferred everything. There was quite a bit of clean up required. Aghast! No Balance Sheet, No P&L, NO other business type reports that my accountant requires?? I then thought the solution was move on up to Quickbooks Mac 2017. Quicken 2017 does not export a QDF file! I have not found a way to transfer as yet. 22 years of financials at a dead end. I have been using Quicken since 1995. I love it. I have tried to update since 2007 and it’s awful Yesterday I bought 2017 and I’m so disappointed. Is there a way to keep 2007 and not risk it becoming technically unusable in the next few years? Can’t someone just upgrade 2007 or make a new application that gives us the features that are so beloved in Quicken 2007. 2017 you can’t even export reports to excel in any reasonable way or get easy quick reports. Is there a group fighting for 2007???? I am in the same boat with 2007 version and have not bought 2017 as I am a manual data entry person and need those reports. I am worried how long I can use 2007 with system upgrades. Have you heard any more? I’m moving to Quicken. My experience with YNAB has been a disaster period. A month into using it it will still not connect to PayPal and, remarkably enough the transactions from my accounts are all over the place; I have transactions from my personal checking account showing up in my business accounts, Janet Jackson’s from saving account showing up in checking accounts, transactions from credit cards showing up in checking accounts. So far as I can tell the customer support is pretty much an nil. All I hear from them is that they’re working on it. Plus their Website Layout is pitiful. Princeton’s you can’t get from the budgeting tool which you will spend much of your time into the website – there’s no link to it semicolon there’s no link to tutorials or blogs, etc. So after doing all the good reviews of YNAB I’m going for Quicken. I have been using quicken for quite a while but I just found out that my 2017 version will not be supported after April 2020. The downloading from banks and updating accounts will be discontinued at that time. That’s what I use it for mostly. I was wondering if anyone here has tried gnucash? I just heard about it and they say it will work on any software OS. I should be able to teach myself how to use it in a year! !